The Xiangdong Fairy Cave 仙洞巖 is a one of the many small but interesting attractions in Keelung, Taiwan 台灣基隆. It’s set in the opposite direction form most of the attractions located near Zhongzheng Park, but is well worth a visit on any visit to the port city. Sandwiched between a sharp bend in the road, the overwhelming Keelung Harbor, and an imposing cliff, the Fairy Cave is easy to miss. If not for the giant golden Buddha statue at the entrance, the cave could easily be mistaken for any average roadside shrine. Inside the cave can be found several shrines to the Buddha and other Buddhist deities, set at the ends of two long, narrow passages. 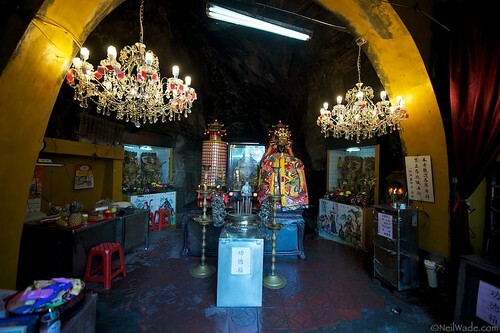 The main chamber is interesting enough with its chandeliers, small shrines, and smaller golden Buddha, but directly behind it is another cave with beautifully carved bodhisattvas and a main shrine dedicated to the Buddha. Down the long, narrow, wet passage to the left is a small, uninspiring shrine to Guanyin (I think) but the passage is the main attraction for most visitors. 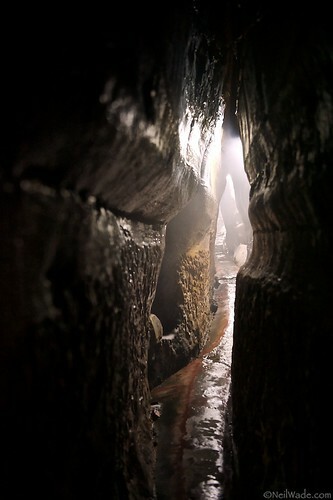 Inside the Xiandong Fairy Cave is a long, narrow corridor that leads to another small shrine. 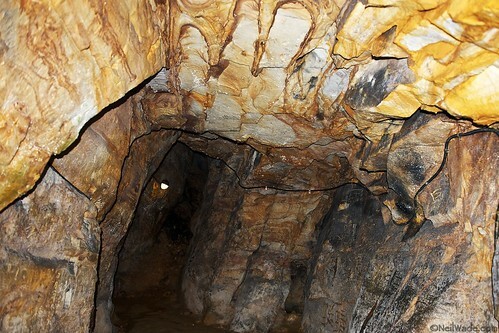 The cave was formed from years of water and wave erosion, as it used to be at the very edge of the ocean. The Japanese were the first to really make record of it. They enjoyed the serenity of listening to the waves break inside so much, that they turned the cave into a Buddhist shrine. No one is really sure when all the other statues were carved and shrines made, but the serenity has endured, despite the waves receding. Next to the Fairy Cave is another cave worth investigating. The Hand of the Buddha Cave isn’t quite as interesting, but finding the stained roof in the shape of a hand might entertain you for a few minutes. 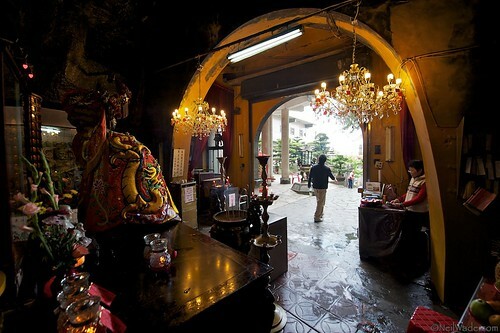 You could also climb up the stairs next to the Fairy Cave for nice views of the Keelung Harbor and a small park. When I last visited, a new temple was being built on the hill that looked interesting… might be worth some investigation. 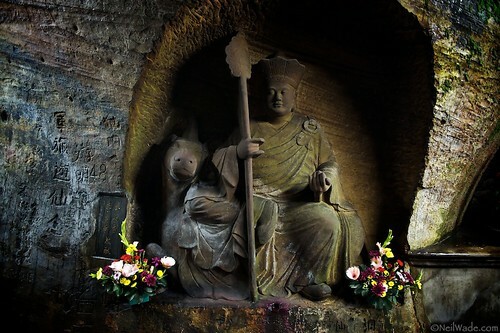 The entrance to Xiandong Fairy Cave has a large, golden statue of the Buddha. 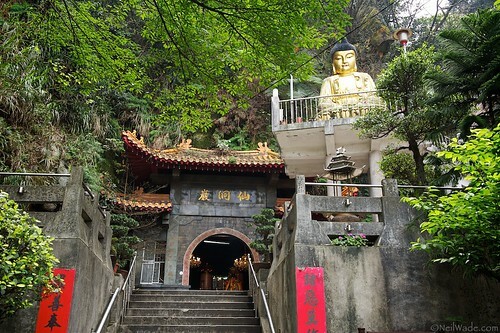 The entrance to Xiandong Fairy Cave has a golden Buddha and two chandeliers. 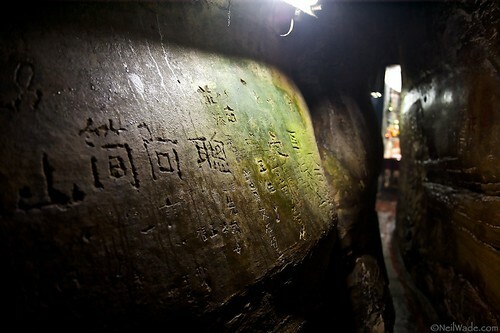 The Xiandong Fairy Cave has several nice cave rock carvings. 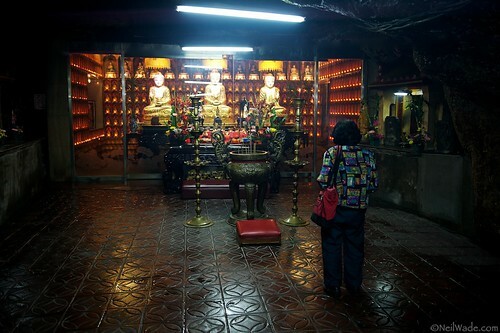 A woman prays at the small Buddhist shrine in the Xiandong Fairy cave in Keelung, Taiwan. 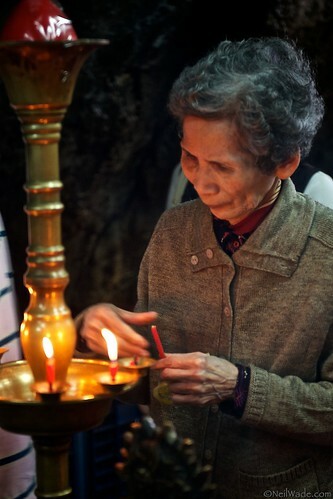 A woman worships inside the Xiandong Fairy Cave in Keelung, Taiwan. 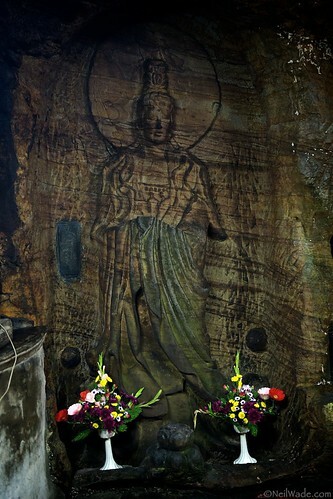 The Hand of the Buddha can be found on the cave's roof if you have a flashlight. 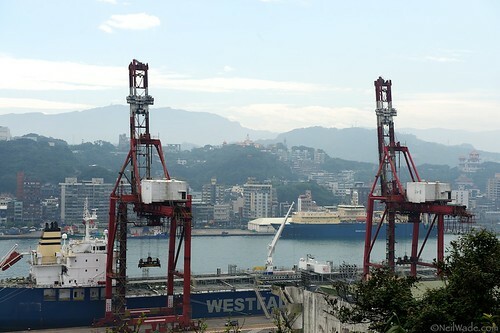 Keelung Harbor and Zhongzheng Park, as seen from the Xiandong Fairy Cave, in Keelung, Taiwan. 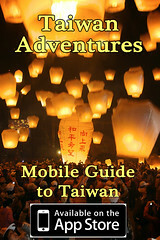 Or read more about it and the surrounding area at Taiwan Adventures Online Guide. Thank you for posting your photos. The information were really helpful. 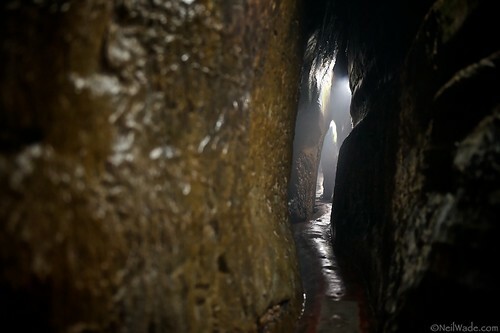 Looking at them is like I’ve been to Xiangdong Fairy Cave too. That is so beautiful! Thank you for taking us in Taiwan! Nice photos! You have given great information as well here! Cheers! Very nice article about the fairy cave. Posts like this inspires me to take more photographs especially the nature photograps. These are great photos. I have never been to Taiwan and I never really thought that you have these attractions. By the way, it would be really nice if you could also feature famous food and your cultures on your next album. Thanks for the information – at the moment they are building an additional gate in front of the cave. Very nice, but the whole experience just takes for 5-15 minutes.